There are Calcutta sounds I itch to hear as soon as I set foot in the city. The fervent mixing of jhaal muri in a metal donga, the crunch of a puchka, the waft of Rabindra Sangeet from an old radio, and an occasional tinkle of the somewhat forgotten tram bell. For a large part of my childhood, the month of April served the sole purpose of a countdown to our annual nani bari visit to Calcutta, where we spent most of May and June. Nani loved stuffing us with Bengali delicacies, and sending plump versions of us back home to our baba. These summer evenings were spent stacked up in an ambassador along with my cousins to visit nana at work. He was a stock trader at Share Bazaar (a.k.a. the Calcutta Stock Exchange), which stood in the midst of a web of crowded gullies at Dalhousie Square, the central business district of the city, at the time. While at work, I remember nana having a phone glued to his ear. His conversations, like most others I overheard in the area, were to do with buying and selling things in quantities of hundreds and thousands. These commodities remained a mystery to me for many years. “What was he buying and where did he keep it?,” I wondered, since I hardly ever found any new things in the house. What made these mysterious things even more intriguing was all the talk about them rising and falling by the minute, as if they were on a roller coaster. Massive piles of chhena are kneaded for sandesh every morning at Girish Chandra Dey & Nakur Chandra Nandy. The art of balancing rows of soft sandesh on a knife. But I was too preoccupied thinking about the shopping spree and street food binge nana would take us on when he was done at work. Our first stop would be A/C Market from where I’d buy imported stationery and cross-stitch embroidery kits, followed by a short drive to Russell Street where we’d all compete to see who could eat the highest number of puchkas and mango kulfis. At the time, the chaiwallahs in those gullies never really caught my attention. Chai was for grownups. 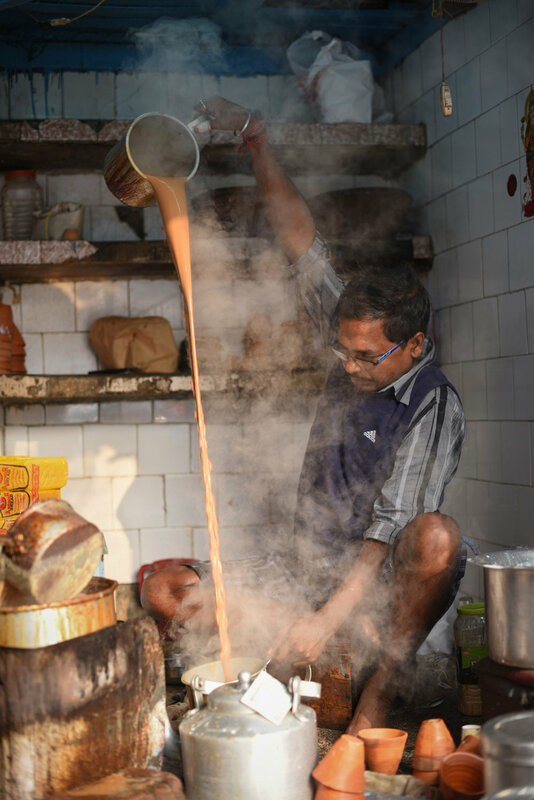 The chaiwallah gives the tea a final mix using two dongas and a series of dramatic pours. The motion reminds me of how we played with a slinky. My most recent trip to the city in December 2016 was for a work project to photograph my first Bengali wedding. While the wedding party slept off the tiredness from the previous night, I spent mornings with my enthusiastic Calcutta family, driving across the city for some delightful early morning experiences. We queued up for freshly made sandesh at Girish Chandra Dey & Nakur Chandra Nandy on Ramdulal Sarkar Street and went on to drink, as a grownup now finally, Share Bazaar ki chai. Early in the morning, Share Bazaar was people-less and peaceful; a stark contrast to the picture I had in memory from all those summer childhood trips. The stage was set. Under a light winter haze, we crossed a street lined with carts of exotic fruits to reach a chai stall at the far end. The crackle of toasting vegetable sandwiches served as background score. Further in, a cave-like shop etched itself out of a building where the chaiwallahs took the stage. It was filled with steam from a dramatic chai-pouring sequence. The aroma of crushed spices and clay filled the air as clay kulhads were passed around. Freshly baked bread is sliced, toasted, buttered and sprinkled with sugar, to be dipped in chai and devoured. Toasted vegetable sandwiches are a popular choice for breakfast. I had my kulhad served to me with a side of fluffy buttered toast sprinkled with sugar, and floated home wearing a t-shirt full of crumbs and my biggest smile. Radhika Agarwal is a sari-clad juggler with a camera, a garden spade, and a spoon at the circus which unfolds around her everywhere. She documents her adventures here.